Anthony has created and implimented many large scale community and charity projects, he is passionate about working with various groups and schools to build awareness and focus on the importance of community, belonging, and rites of passage. In 2014 The Breslin Gallery hosted and co produced with "A Path to Follow" an exhibition and event to raise awareness and money for mental health support. In March 2014 The Breslin Gallery, hosted managed & curated the exhibition "juxtaposition" featuring artists Mark Howey, Sara Catena & Micael Jenkins. In December 2013 The Breslin gallery hosted an exhibition featuring the work of Jessica Charlotte, Bruce Earles, Mark Ewenson, Andrew Pearson, Phoenix, Ian Rogers, Merry Sparks & Lee Trewartha. In July 2012 TVH gallery hosted Anthony Breslin's solo show "Business as Usual" at their Seaforth gallery. The show featured Anthony's work as well as launched a Breslin range of leggings & fair trade T-shirts! This trailer was filmed & edited by Harvey House film productions. 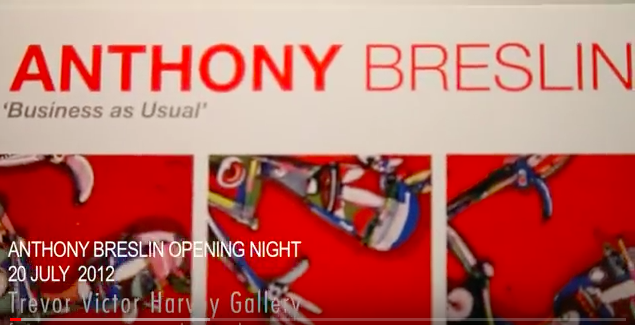 This video shows Anthony Breslin's Trybe; an opera in paint from the over head camera only. Its a recording of one performance from a 10 show season in March 2013 at the main theatre at Chapel off Chapel, Melbourne, Australia. In October 2009 Anthony Breslin worked full time at Christian College Geelong to create an ambitious, world-first installation/ performance art piece entitled "the art of football". In this time over 500 students worked on creating the visual and performance aspects of this unique football match. In 2009 cultural infusion approached Anthony Breslin to run a very different project within 10 remote schools. He came up with an idea that would result in a unique, malleable, mural being created that the school could hang. The Myer windows in Bourke Street were turned into a studio and the gallery where Anthony created art in front of an audience and then exhibited with the potential to be bought within seconds of its hanging.